The stage is now set and in a few weeks time, ladies and guys across the country and from the Diaspora will gather at the nations capital of entertainment-Lagos for the national screening of Nigeria's biggest male and female pageant, The MR. & MISS INTERNATIONAL NIGERIA. Following constant phone calls by prospective contestants who are yet to purchase their entry forms due largely to the ASSUU strike, ACT'V MEDIA GROUP, organizer's of the event have rescheduled the national screening date of the event to the 29th of august 2009 in Lags. A total of 32 contestants (16 male and 16 female) would emerge from the screening for the grand finale event. 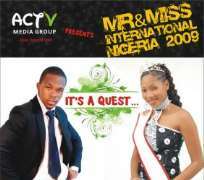 The contestants would undergo a one week camping period preceding the grand finale and crowning of the MR. & MISS INTERNATIONAL NIGERIA winner(s). The grand winners will cart away various prizes including a brand new car, annual salary, one year brand endorsement package valued at 1 million naira and a one year modeling and profile management contract with a top Nigerian modeling agency. Runners up will also go home with cash prizes and various consolation prizes. The pageant is opened to all Nigerians in home and in Diaspora between the ages of 17 to 26 with good communication skills and must be at least 5 feet 7 inches tall and above.